Patrick “Hattrick” Marleau has recorded a natural hat trick! Patrick Marleau became the 12th player in NHL history to score 4 goals in a period & the first since Mario Lemieux on Jan. 26, 1997 at MTL. Conor Sheary, Thomas Greiss and T.J. Oshie named NHL’s 3 stars of the week. Michel Therrien confirms that Alex Galchenyuk will not play against the Flames on Tuesday night after re-aggravating his knee injury. Avalanche’s .311 points percentage is the worst of any NHL team — since the 2000-01 season (480 teams). That’s something. The Sens have acquired forward Tommy Wingels from San Jose in exchange for Buddy Robinson, Zack Stortini and a 2017 7th-round pick. According to Paul Maurice, Patrik Laine is in the lineup tonight. Brent Burns hit 20 goals in 48 team games to become fastest d-man to hit mark since Kevin Hatcher in 1992-93 (20 in 48 team games w/ WSH). Brent Burns is on pace for 35 goals. Last defenseman to have that many was Paul Coffey in 1986. Arizona’s Peter Holland fined $3,611.11, the maximum allowable under CBA, for a punch to an unsuspecting opponent,Tampa Bay’s Ondrej Palat. On Thursday, 1/26, Doug Wilson will become the 4th GM ever in the NHL to reach 1,000 games as a player and 1,000 as a GM. The Toronto Maple Leafs have set a new franchise record by picking up at least a point in their 11th straight road game. Canadiens acquire defenseman Nikita Nesterov from Tampa, in return for defenseman Jonathan Racine and a 6th round pick in 2017. Patrik Laine becomes first rookie to reach 40 points this season. The Islanders have gotten 9 out of 10 possible points in their last 5 games after firing Jack Capuano. Tortorella will miss tonight’s game and the All Star game due to a family emergency. It took the Vancouver Canucks about 28 minutes to take their first shot against the Arizona Coyotes. Flyers end Leafs 11 game road point streak. 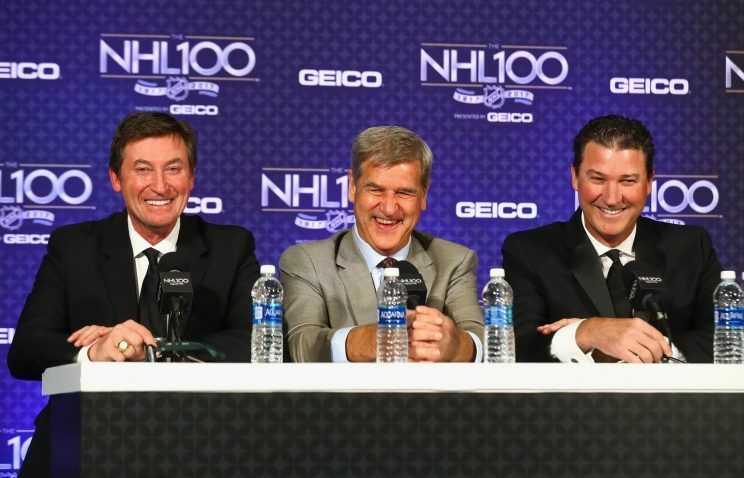 Gretzky, Orr, and Lemieux. The three greatest players of all time. Connor McDavid has officially broken Mike Gartner’s record as the Fastest Skater! Las Vegas will be able to start making player transactions around March 1, including trades related to expansion draft. Sidney Crosby is now the captain of the current Olympic, World Cup, Stanley Cup, and All Star Game winning teams. What are your thoughts on Holly Murray’s Power Rankings? http://mrfantasyfreak.com/blog/holly-murrays-2016-17-third-period-nhl-power-rankings Should the Caps still be #1?